Control GX Shampoo by Just For Men Reviews - Is it a Scam or Legit? Control GX Shampoo by Just For Men uses a formulation that reacts with air and traps color in the hair shaft, gradually reducing your numbers of gray hairs. What is Control GX Shampoo? Control GX Shampoo by Just For Men claims to use breakthrough technology that can gradually reduce gray hair with each shampoo for subtle, natural looking results. The manufacturer tells us that you'll use Control GX just like any other daily shampoo. After a few washes, you'll notice a subtle reduction in the number of gray hairs. From there, you have complete control over how gradually your gray disappears at the start by using every day, or every other day. When you’ve achieved the look you want—often within two to four weeks—you’ll continue using Control GX three to four times per week for maintenance. Results can last up to eight weeks. In addition to gradually reducing your gray, Control GX Shampoo also promises to gently and thoroughly clean and revitalize hair, while increasing volume for a thicker, fuller look. Just For Men’s lineup has been a staple among hair and beard coloring products for decades, but does this necessarily mean that their Control GX Shampoo is worth the money? Even then, is it really “shampoo with a brain”? Here, we’ll discuss all the essential facts so you can make a more empowered purchase. What Causes Grey Hair and Is It Reversible? The Library of Congress tells us that your chances of going gray increase about 10-20% every decade after the age of 30, although the medical community still doesn't largely understand why this occurs. Melanin is a pigment polymer that gives your skin and hair its natural color, which is delivered via specialized cells called melanocytes. In the instance of hair, these cells are located at follicles and inject color as the shaft grows. At some point, these melanocytes slow or stop their pigment production, leading to gray, colorless hair. While the gene for gray hair seems to have been recently identified, there is no cure for the condition, outside of coloring products like those from Just For Men. In the instance of Control GX Shampoo, exactly which ingredients does it use to deliver results—and are they clinically proven to work? 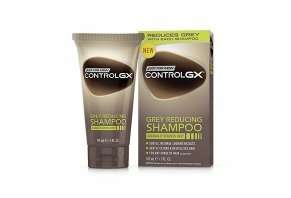 How Do Control GX’s Ingredients Gradually Reduce Grey Hair? Like most hair care and coloring products, authoritative websites report that the majority of Control GX’s ingredients work as surfactants, emollients, emulsifiers, thickeners, pH regulators, hair dye agents (N,N-Bis (2-Hydroxyethyl)-p-Phenylenediamine Sulfate), enzymes (1,2,4-Trihydroxybenzene), and preservatives. Just For Men tells us that Control GX’s formulation also contains a patented blend of molecules that break when massaged and exposed to air, releasing small amounts of the complex and trapping it in the hair shaft every time you shampoo. In layman’s terms, Control GX is essentially hair dye in shampoo form that, instead of coloring all your hair at once, deposits molecules over time, which then build up and hide gray over the course of several weeks. Will Control GX Shampoo Cause Any Side Effects? Some Just For Men customers have reported chemical burns and allergies from the use of the company’s products, so they mandate that you perform a preliminary 48-hour skin allergy test with Control GX, according to directions, before full-scale use. The company also notes that Control GX shouldn’t be used if you’ve experienced a reaction to other hair color products, if you have a rash or your face, or an irritated, sensitive, or damaged scalp. Temporary black henna tattoos may increase your risk of allergy. In rare cases, the use of hair color has been associated with temporary and permanent skin depigmentation (lightening). Just For Men tells us that Control GX Shampoo can be used on any shade of hair, although it’s advertised as ideal for light brown to black hair. You can also use it with other hair care products, but not on hair that has been lightened, bleached, highlighted, or colored. Pro tip: Many customer reviews we read also mentioned that—like other hair dyes—Control GX has a tendency to stain fingernails, the shower area, and towels. As a result, they recommend massaging it in using your palms, thoroughly rinsing the shower area when you’re finished, and using dark towels to dry off. A 5 fluid ounce tube of Control GX Shampoo (enough to last for approximately six weeks, according to the manufacturer) is available at most retailers who carry Just For Men products for between $8 and $9. It can also be purchased directly through the company for $8.49, with free shipping on all orders over $14. Money saving tip: At the time of writing, you could also obtain a $2 off coupon on the Just For Men website. In addition to Shampoo, Control GX also offers a 2-in-1 shampoo and conditioner that contains additional agents for easier combing, softness, and manageability, for the same price. Are customers reporting a solid return on investment at this price? Control GX Shampoo Reviews: Are They Good? On the Just For Men website, Control GX had an average rating of 4.5 stars based on 300+ customer reviews. Most compliments referenced good coloring results, natural appearance, and ease of use, while what few complaints there were often related to messiness and minor nail discoloration. What it similar elsewhere online? We also encountered nearly 50 Amazon customer reviews for Control GX, who had given the shampoo an average rating of 3.7 stars. There, most of the compliments and complaints matched those on the Just For Men website. According to Amazon’s Questions & Answers section, a couple of customers replied that they didn’t recommend Control GX for super short hair (1/4 inch or less). Another reviewer mentioned that you might want to use gloves to avoid staining your fingernails. From a company perspective, the Just For Men lineup is manufactured by Combe Incorporated based out of White Plains, NY. They had an A+ rating with the Better Business Bureau and only two complaints as of 2/14/16, which referenced product formulation and side effects. Does all of this mean you should spend your hard-earned money on Control GX? Are the Gradual Results Provided By Control GX Shampoo the Way to Go? Perhaps the best-known gradual metallic hair dye is Grecian Formula, although Just For Men’s Touch of Grey treatment seems to deliver similar results. And both of these options are likely available locally for about the same price as Control GX. How to decide? Just like anything else we choose to put on our body, the ‘best’ way of getting rid of grey hair will be based on your hair color (including level of grey), your hair cut (as well as any hair loss you’ve experienced), your skin type, and dozens of other personal factors. In other words, there’s no way to know without giving it a try. Fortunately, Just For Men stands behind Control GX Shampoo with a 100% satisfaction guarantee, as might the retailer you purchase it from. This way, you might not lose much more than a little of your time (and perhaps return shipping charges if you’re not near a retailer) for giving Control GX a shot and end up dissatisfied. In England, it is said that men who have a full head of hair which is grey, ala John Kerry, although I think he wears a "syrup" (English rhyming slang, "Syrup of fig-wig"), that they look distinguished, but if they have little hair, and what they have is grey, then they look extinguished. I have been using JFM products for just over 30 years and I am now three score years and twelve. To start with, they were a two-part mix and the results were instant, and I got some obtuse comments from some ladies alluding to whether I used hair colorants or not, and that was despite not leaving it on for long. Really messy too. Then in more recent years, there was an oxygen activated product, a precursor to Control GX, in a small tube, which was great as being parsimonious, I could use as little or much as I wanted, when I wanted, and the rest stayed in the tube for another day. Had to measure out 50 percent of the two-parter, above to save on waste. With this, there was no mess. Now we have Control GX. This really does work. With my years of JFM knowledge/use, I have worked out a regime, some of which has already appeared in previous reviews. What I am posting below is what I have found works for me, and except for the bit about gloves, is IN NO WAY intended to countermand JFM’s instructions, and I will NOT be held responsible for the actions of others if they follow what I do! OK, wearing gloves, I would suggest, is mandatory when using this product. When using the two parter years ago they even supplied gloves. Initially, they were good quality (latex), but in order to cut costs, they later supplied a rubbish cellophane type which went straight in the bin for me to buy my own. I have found that blue vinyl ones are better than the paler white latex ones. Apparently, one has to use palms in order to apply pressure to break down a constituent within the product for it to react with oxygen to work. Using gloved fingers allows me to exert more pressure and it allows greater accuracy of where to put pressure. These gloves can be easily purchased from a hardware shop, market stall or a motorist spare part store in boxes of 100. Although credited as "single-use," I rinse them well and use them until one falls apart. (Ever the parsimonious Capricorn!). I squeeze product into a glass desert dish so can more easily gauge how much I am using and can instantly close the tube afterwards to prevent air/oxygen getting back into the tube. Using one of those long handled brushes as favoured by ladies hairstylists when applying hair colorant professionally, I can apply the product more easily to where I want it first. It also allows pressure to be put on the roots first. One of those brushes can probably be purchased from the pharmacy where you buy your product. Once the product has been applied all over, I can then massage the product in with gloved fingers. I have a stop watch which I start when I first apply the product. I wait for 10 minutes before I rinse off in the shower. I have found that the product continues to gradually work for many days after application, so there is no need for me to use it daily. A couple of tips. Whilst it is not normally messy to use, it is better to stand on an old towel on the floor when applying it. One would normally do this in the bathroom above the basin, so fill it with warm water and have a cloth of some sort to hand (one of those blue/white checked "household" cloths are ideal), wet to mop up any little splashes. The gloves are going to be well and truly covered in the product, so before you climb into the shower, whilst still wearing them, rinse the gloves in the basin. The water will turn a dark purple colour with white bits mixed/floating in it. Gently pull the plug and let the water out rinsing gently as it drains. Refill basin and rinse gloved hands again and also the cloth. I use the cloth in my hand to handle everything until my hair is rinsed. Taking the cloth in the shower with me enables me wipe my face and to cleanup little splashes. They are easy to see as they will be a pale purple. Once the water is running clear, I then remove the gloves and shower as normal. As I said, this regime works for me; it is your choice as to whether you go down my road or not. The product does change the color of my hair, but it is also making my hair fall out in dramatic fashion. I had to stop using the product and now have to figure out how to detox my scalp and my body from the chemicals that caused the fallout. I have no idea if the lost hair will ever grow back. If anyone has had any success in growing back the lost hair, then please share. Starting to get depressed. I started going gray early, starting at 26 and really gray at 46. I didn’t mind it so much because it was a mix color. At 49 I was just super gray with all my hair. I figured I’d try this. After 2 uses it brought a lot of my hair back to brown. My temples remained a bit gray but it didn’t bother me. Honestly, since I didn’t want drastic change, I use it only once every 3 weeks and it gives me enough color to feel like I did at 35. If I use it too much, especially in summer, it seemed like the color caused my hair strands to bind together a bit, kinda weighing my hair down, which is why I don’t like to overdo it. In fact, using it once, letting it be for 3 days, seems to allow it to comb through even more. It might be why some people report hair loss. It’s not really hair loss, rather your hair will weigh down a bit after first used but it gets better just normal showering a couple of days after. So I suggest using it once every 3 days at first then stop for a couple of weeks and see how you like it. I go 3 weeks between use. Do exactly as the instructions say, leaving it in a minute. Use palms to massage it in it will slightly discolor nails temporarily. This product does work. It takes several uses because it does the color change slowly and naturally. I wear rubber gloves when applying. I am a female and it works great on my hair, but a male friend uses it also, which is the reason I tried it. But anyway, it works great! I used it as at my step-father's house while showering there, and became interested in the product (but no noticeable results after that one use). I used it every day for 5-6 days, and my mostly salt with pepper hair went back to salt and pepper. It was gradual enough that my family (wife/kids) didn't notice this gradual change in darkness. I finally fessed up to my family, and they realized the change. My hair was previously black, and it has darkened mostly to my natural hair color, perhaps a bit more dark brown. The top of my head in particular darkened up, with the sides still having enough "salt" that it looks very natural. I've stopped after about 8-9 applications, as I want a still more natural salt and pepper - and have just changed the salt to more pepper. Two issues: Firstly, I did notice a slight change in hue of my white hair. Due to the contrast in my black hair, the white was always very brilliant looking. It now looks more dull, or perhaps a slight blue hue that I've seen on other reviews. Definitely not a blue hair though. Also, when I was using it intensively for 5-6 days straight, it made my head itchy, so I stopped for a few days. Then I proceeded for 2-3 more treatments, and that kept my head at a more natural and gradual dye job. I'm waiting to meet up with a close buddy I haven't seen in about a month to see if he will notice...Very natural and gradual, well within your control to see how dark you can go. My wife (who loves my white hair) has encouraged me to keep going! I am using Control GX for three weeks with one problem. It has changed the color of my hair to a blue tint gray, which is very noticeable. The shampoo does work great, but it would be amazing if it was not for the blue tint. This product is not for African American people because I tried it for a few weeks and it doesn't really work for me. Maybe I should leave it in a little bit longer, I don't really know, but I don't think that I would buy this again. Beware: you could get bald in no time! It works, in a sense that you get rid of gray hair, and it looks ok. However, you may start losing hair in dramatic fashion! I think I lost 70% of hair on top by using one and a half tubes of Control GX for three months. Hopefully, it will start growing again. This was a BIG mistake. I have been using Control GX for about a year now. I am very pleased with this product. Right about six months or so into it, I noticed that I was losing hair. I read some reviews where others complained of same results. One day, when I was getting my haircut, I asked my girl to go easy on cutting my hair since I was losing hair by dying it. She told me that it was unlikely to lose hair from dye. She suggested it may be from medication or diet. She was absolutely correct. I had a back injury around that time and was taking prescription pain meds. When I stopped taking my meds, my hair got thicker again. I take a shower and wash my hair daily. I use the product 2 to 4 times a week and use regular shampoo in between. I was 90% gray. Now I'm about 5 percent gray on the side only, which looks totally natural. Btw, it also works on other parts of the body, despite what the manufacturer says. Not only does this product works for men, it works for women as well. In the past, I used female dyes, which only irritates and dries my scalp, but I used the product only twice and all I could say was "wow!" I saw the ad on TV and said "what the heck," so I bought it and was overwhelmed. I am NEVER going back to those harsh chemicals ever again. Best thing I have found. Great results with no ill effects! I am a 60-year-old Caucasian man. My natural hair color was always very dark brown, appearing black. Over the last twenty years it has gone more and more grey, and in the last five, it went way too grey to get away with calling it salt and pepper. It was near white. I wear a short cut, approximately 1/4 inch over the ears progressing to 1 to 1 1/4" on top. I have a full head of hair with no balding pattern, but it is noticeably thinner in the last ten years. I tried the Control GX product mainly because I am a performer and I could not get roles I wanted without temporary dye, which always looks like crap. This product seemed to me to be accomplishing nothing for about five weeks used every day, until I saw some people I had not seen in that time and the first words they said were "Wow, you colored your hair. It looks great!" I tried to BS my way out of it but they had photos taken in the exact place we were standing at the time, and I was wearing the same shirt! They shot identical photos under the same lighting and did a side by side and there was no getting around it; my hair was many shades darker and looked absolutely natural, and it had been so gradual that I couldn't tell on a daily basis. Perhaps the most telling factor: I am getting the parts I want (and not just in my hair!) I used the tiniest amount of shampoo each time, perhaps a half teaspoon. I used my fingertips and did notice some very minor staining. I solved that with a clear matte polish which I use on stage anyway. I let it sit about five minutes with each use as I shaved and washed the rest of myself. Tube says one minute. You will find that the color stains the tip of the tube and if you touch that it suddenly looks like you picked up a melted Hershey bar. DON'T TOUCH THE TIP! Oddly, the shampoo is not dark out of the tube nor sitting on your head. Apparently the "dying" effect is a result of it building up gradually on your hair. Does it ONLY dye the grey? Not bloody likely, since it stains everything else it touches, according to the package, but perhaps it only actually adheres to the grey dues to some physical difference, or perhaps is just seems that way. I couldn't care less. IT WORKS. There is no odor to the product. No scent or perfume etc. I did not find any problem of staining towels or tiles, etc. IMHO, this is a great product. I am STILL waiting for my wife to say something. I don't know if she hasn't noticed or is "protecting my dignity" by not mentioning it. I am waiting for when she does and I can say "Wanna try it?" LOL. Buy this product! Write a Review for Control GX Shampoo by Just For Men!